General Motors is partnering with three EV charging networks to make public-use charging stations more commonplace. // Photograph Courtesy of General Motors Co. The lack of a robust charging infrastructure is one of the major hurdles hampering widespread consumer acceptance of electric vehicles. General Motors Co. plans to change all of that by collaborating with three of the nation’s leading EV charging networks to create the largest vehicle charging network in the U.S.
GM today announced it will collaborate with EVgo, ChargePoint, and Greenlots to enable EV drivers access to more than 31,000 charging ports. GM plans to aggregate dynamic data from each of the EV charging networks so owners of the all-electric Chevrolet Bolt EV can have a more seamless charging experience with their GM vehicles. Dynamic charging information received from EVgo, ChargePoint, and Greenlots will enhance future versions of the myChevrolet app1. New information to be provided by the charging networks will include real-time data on whether a charging station is working, available, and compatible with a Bolt EV, offering a one-stop shop for all range and charging data before or during a trip. GM also expects to make enrollment for charging with the networks easier by creating an app interface for all three networks to streamline charger access, and potentially allow activation of a charging session using the app instead of a membership card. The myChevrolet app recently was updated to enable projection of the Energy Assist feature to the vehicle’s infotainment system via Apple CarPlay2 and Android Auto3 for drivers with model year 2017 or newer Bolt EVs. The update enables Bolt EV drivers to access certain features through their vehicle’s infotainment system, such as vehicle range, charging station locations, and search, as well as route planning that takes into consideration charging stops along the way if the destination is out of range. Original purchasers of new Bolt EVs will have access to these features at no additional cost for five years from the vehicle delivery date after they accept the myChevrolet mobile app terms and review important information about using Energy Assist features within the myChevrolet app. Vehicle users should see user terms for limitations. 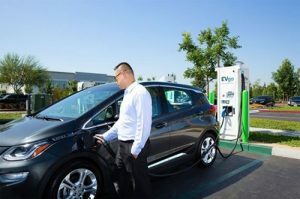 GM expects to finalize the terms of its collaboration and agreements with EVgo, ChargePoint, and Greenlots during the first quarter of 2019.